Pregnancy requires the elimination of many foods and drinks because they might harm your or your baby's health and compromise your pregnancy. Hibiscus is one herb you should use with caution if you are pregnant because evidence indicates the potential for harmful effects during pregnancy. Always talk to your doctor before taking any supplement. Hibiscus is a tropical plant most often used in herbal teas and as a food coloring agent. The hibiscus flowers also are edible. It has a history of usage for a variety of health problems, including diarrhea, inflammation, headache, toothache, asthma, burns, cough, fever and menstrual abnormalities. Some evidence shows potential for the use of hibiscus to treat cancer and hypertension, reports Drugs.com. 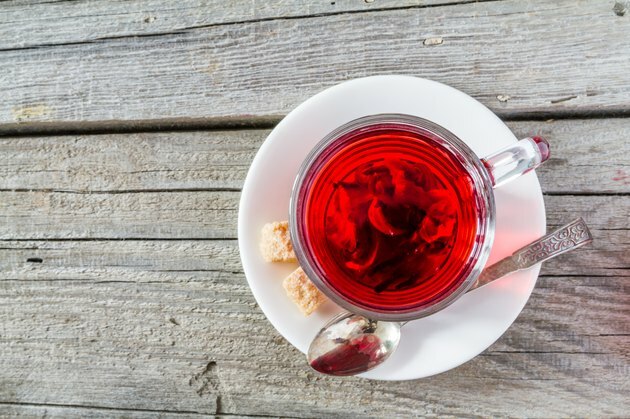 Drinking hibiscus tea during your pregnancy increases your risk of several complications and should be avoided. Hibiscus could induce your uterus to begin contracting, which could result in a miscarriage, reports Baby Center. Products that are marketed as "pregnancy teas" still might contain unsafe ingredients, including hibiscus, and their use always should be discussed with your doctor prior to consumption. If you have accidentally ingested hibiscus, call your obstetrician or make an office visit to ensure that your baby is not in danger. The most common product you will find hibiscus in is herbal tea. Drinking herbal tea during pregnancy has several health benefits, including providing antioxidants, and some even contain vitamins and minerals that support your health and the growth and development of your baby. It also is caffeine-free. Some doctors recommend avoiding all types of herbal tea if you are pregnant, but if yours approves of it, be sure to read the labels carefully to avoid unsafe ingredients. Hibiscus has a couple of other names and might appear on an ingredients list as rose of Sharon or althea. Since some products get their color from hibiscus, look for its presence in artificially hued foods, such as baked goods or beverages. If you enjoy herbal teas but are avoiding them until you deliver, choosing a non-herbal tea as a substitute typically is healthy. Keep in mind that regular tea contains caffeine, so limit your intake or select a decaffeinated version. You might like to try making your own tea as well. Baby Center recommends adding honey, fruit juice, lemon rinds, cinnamon or cloves to boiling water and steeping the mixture. These ingredients are safe during pregnancy and the flavors mimic those of many herbal teas. If you enjoy eating hibiscus flowers, experiment with different fresh herbs to create a similar flavor. Is it Safe to Drink Honey Lemon Tea While Pregnant?